How do you review a show that makes no sense, has no proper storyline and leaves you completely confused but is so entertaining and ridiculously hilarious you can’t help but be amazed by what you have just witnessed? That’s the dilemma I’m facing right now. Instructionally Invited is an immersive piece of performance art – I’m struggling to refer to it as “theatre” – currently on at Vault Festival. Its first run at The Space last summer received mixed reviews and I can see why. If you are entering this show expecting any kind of narrative you will most likely come out disappointed. With Instructionally Invited Gruff Theatre offer an immersive experience in which you are the guest at a completely mad party. I don’t want to give too much away which is why I won’t go into any more detail. “So if this show doesn’t even have a plot why should I go see this?” you probably ask yourself now. The answer is simple: Because you will experience and hour of absolute madness and will leave the room with a big smile on your face. “The Beings” as the characters in the show are called are funny, weird, a little gross but always entertaining – a bunch of comical eccentrics. Don’t expect them to make any sense even though they are behaving strictly by the rules – if only we had the slightest idea what these rules were about. Audience participation is part of this performance and although you won’t be humiliated in front of a crowd you have to be open for some rather strange requests. There are not many shows in which you end up with your ear on another audience member’s shoulder and being required to dress up in a scruffy coat might seem a bit strange too. Personally I enjoyed Instructionally Invited a lot and judging from the huge smiles I saw on my fellow audience members’ faces I’m guessing so did they. However, I do think this show will only appeal to a rather limited audience. Regular theatre goers might miss an actual story and I can see that a few of the interactive bits will put some people off. If you enjoy immersive / interactive theatre in general and are open for something smaller and more experimental than all those big scale productions put on by Punchdrunk, Secret Cinema etc. 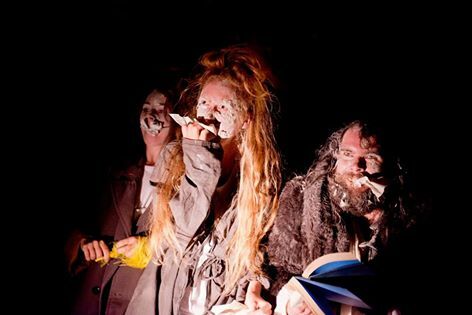 then please go and visit “the Beings” at Vault Festival. Find Gruff Theatre Company on Facebook and Twitter @GruffTheatre .